← 150 Years of Unity? In the era of the image, media and spin presentation is ever-important. Avid followers of Premesso will recall a post offering interpretations of an old photo of Berlusconi with a sidearm a few weeks back. 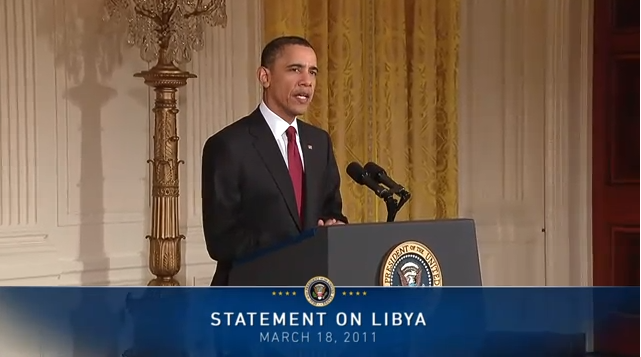 This time we turn our attention to Obama’s announcement of American support in the current war in Libya. What’s interesting about the video is how Obama stands completely alone. Unlike Bush in the run-up to the invasion of Iraq, there are no medalled officers or sober government ministers flanking him. It suggest certain things about our individualistic culture, of course, but it’s also profoundly misleading – how often is it that a single leader takes a country to war? Furthermore, is it odd that a country as large and diverse as the United States invest so much power in the office of the president? This entry was posted in america and tagged body language, individualism, obama, presidential office. Bookmark the permalink.